The surprising death of Prince, not long after the death of Zaha Hadid, makes me wonder who will be next. I am not morbidly wondering what great artist, architect or designer will soon leave this world. I am instead wondering who will be the next person who will transform the ordinary. I admire everyone who envisions and creates music, art or form, in a building or on a body, which is truly transformative. 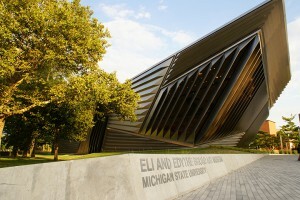 I am blessed to have the opportunity to be inspired by Hadid’s work every time I drive through East Lansing. These recent, untimely deaths of icons reminded of a conversation that I had with my son when he, at a very young age, was fascinated by fine art. I was holding him so that he could take a closer look at works of art on display at a museum in Grand Rapids. His interest started to wane and his eyes wandered about the museum. When I asked what he was looking for, he asked where they kept the paintings by dead people. He was, literally, a babe in my arms yet he had come to appreciate that the artists he had studied were dead and he had little interest in the new and not yet famous. While my son’s favorite artists, Prince and Hadid deserve their pedestals, I hope that the untimely passing of music and architecture icons will cause us to look forward. Wondering who will be next is a reminder of the need to give time and attention to the not-yet-famous visionaries that walk among us.